The year is nearly finished, but violence and persecution of Shias does not appear to end. The current trend for the year shows a decrease overall, but that is heavily skewed by the most recent month being lower than everything we have seen so far. Without September in the yearly data, there would still be a downward trend in Shia deaths, but the amount of Shia injured would be increasing while the amount of Shia detained remains at an average of 62 per month. As the bar graph and line graphs illustrate, all three variables are significantly below the line of best fit for the year. Over the course of three quarters, there were 20 countries that exhibited anti-Shia actions or attitudes, and these incidents were committed by individuals as well as government representatives. This year began with 4 countries with incidents of anti-Shiism, and in 9 months it has increased fivefold. The worst day this year for Shia Muslims was March 20th when there was a triple mosque bombing in addition to other incidents of anti-Shiism in Pakistan and Iraq. There were a total of 150 deaths and 363 injuries from this incident in Yemen. If one looks at the graph “Total Deaths, Injuries, and Arrests of 2015,” then it will be observed that there are a few spikes in the number of wounded. 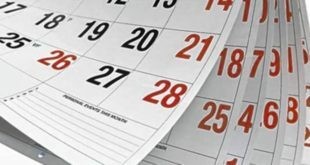 The first sharp increase occurs in February when there were multiple days within one week with a hundred or more deaths. The second spike is the Yemen mosque bombing in March, and the third spike is the mosque bombing in Kuwait in June. In August, we saw a week where there were a large amount of bombings in Iraq in popular markets, and that explains the bump in the data in the middle of August. There were 3440 Shia deaths in nine months, and the most common method for doing so are bombs (70%), usually improvised explosive devices. Assailants were then most likely to kill Shias using a combination of weapons (19%), usually an IED followed by gunfire, shooting (4%), and finally air strikes (3%) and mortars (3%) on their own were responsible for the next most amount of deaths. Iraq accounts for nearly 80% of all the Shia deaths within the year, while Yemen has 10%, and Pakistan has 6%. 4449 Shias were injured during attacks, and over 90% of those people were injured from a bomb detonating. The next two likely ways for Shia to be injured was by being beaten or hit by mortars (3%). 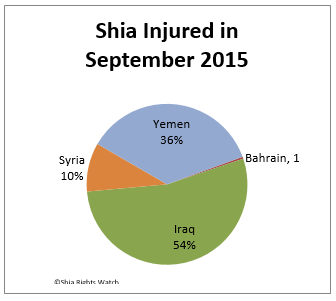 Iraq also had over 70% of the Shias injured for the year, followed by Yemen at 12%, Kuwait and Pakistan at 5% each. In nine months there were at least 502 Shia arrested, abducted, or detained by oppressive regimes. 145 Shias were abducted, and 134 of those occurred in Afghanistan. On average, 380 Shia died every month for their religion, and nearly 500 are injured for a universal freedom. That equates to more than 12 people dead per day, and more than 16 people injured for choosing a religion that is not in the majority. Every month, about 55 Shias are jailed, given unjust trials, and abducted from their homes or vehicles. There was a decent decrease in Shia deaths this month compared to last month, and a significant decrease in the amount of Shia injured when one observes the statistics from August. The amount of Shia arrested this month fell drastically from 63 to 4. There were under 300 Shia deaths, and more than 250 injuries this month. The numbers average out to more than 9 Shia deaths per day, and 8 injuries per day. This month is an outlier in the data for the year, and hopefully it is an example of what we will continue to see as the year continues. This report will analyze the data compiled on Shia deaths, injuries, and arrests that occurred between September 1st and September 30th. The data for this report was gathered from a variety of different sources. The most well-known incidents of anti-Shiism were retrieved from stories that are reported to Shia Rights Watch by eyewitnesses. Each incident is thoroughly evaluated for both authenticity and relevance. For an incident to be included in this report it has to show clear intent to target Shia Muslims on the basis of religious beliefs. 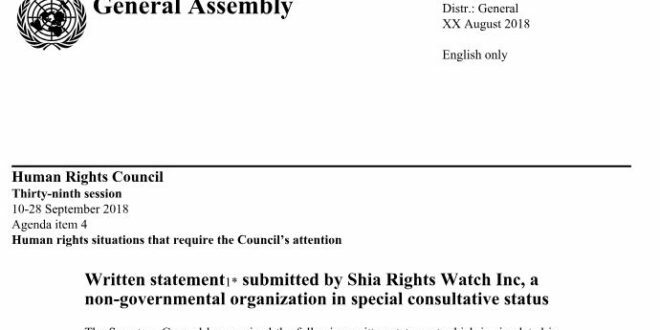 The subsequent sections will present and analyze the data gathered by Shia Rights Watch for September. Where have Shia Muslims been targeted? In September, Shia Muslims were victims in eight countries: Iraq, Yemen, Syria, Afghanistan, Pakistan, Bahrain, Saudi Arabia, and Azerbaijan. There were a total of 290 Shia Deaths this month, and 255 injuries as well. There were only 6 Shias arrested this month that we are aware of, but there are many who were arrested and lack proper legal representation. Iraq currently has the threat of being fragmented, by the encouragement of people within the United States government as well as the allegations of corruption within the Iraqi government. Major political figures have advocated for a three separate states for Iraq to break into; the Sunni state, Kurdish state, and a Shia state. This action would further sectarian/ethnic tensions in the region, and make countries with disgruntled people more likely to take desperate measures to hold onto power. This creates a problem for Shias in Saudi Arabia, Bahrain, Yemen, and others where the government will do what they can to cling to power even if the threat is nonviolent protesters and international attention. The allegations of corruption stem from the Sunnis being deposed from their positions when Sadam Hussein was removed from power, and the Shias gained the same positions of power when they took control of the government. Iraq’s Prime Minister, Haider al-Abadi, has agreed to reforms which would include more Sunnis and Kurds into the government, but this can be dangerous for Shias because there is a possibility for revenge. All parties need to let the things that occurred in the past remain in the past, and move forward to create a functioning country. In general, this month was a significant improvement from past months, and it also applies to Iraq since it usually accounts for a large majority of violence. 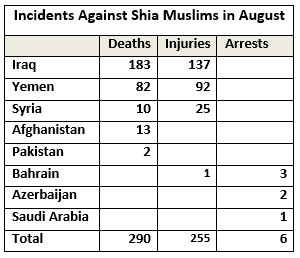 There were 183 Shia deaths and 137 Shia injuries as compared to 275 and 603 respectively for August. There was not one day or one incident in Iraq that had a larger than average amount of casualties. Even though there has been an improvement, this senseless violence against Shias needs to stop. The Saudi Arabian Coalition forces finally made headway in the Southern part of Yemen with soldiers on the ground, but the indiscriminate offensive on the North continues with air strikes. Most, if not all, of the government has returned to Aden, and stated they want to restore the country to civility. Egyptian troops have joined the ground coalition, and the ground forces seem to be impeded at Marib from taking back the capital of Sana’a. There are legitimate concerns about if there will be retribution against all Shias once the country is back in the hands of the Sunnis in the South. Not all Shias fought with the Houthis or Ansarullah, but it is likely that revenge will be sought arbitrarily. The Shia deaths that were recorded in Yemen this month were a result of Saudi Arabian Coalition forces performing air strikes and Daesh bombing Shia mosques. The Daesh mosque bombings in Sana’a later in the month were not recorded, because Daesh was targeting the Houthis in an area that is well known as Houthi territory. The dual mosque bombings in Sana’a in the beginning of the month killed 32 Shias and injured 92 more Shia. There were at least 50 deaths from air strikes, and most of those hurt from the attack are said to be women and children civilians. Earlier in the month the coalition forces hit a hospital which resulted in several casualties. The attack on the teachers was carried out in Amran, and the other five Shias were killed in Sadaa. This is the worst month for Yemen in terms of casualties since the triple mosque bombing committed by Daesh in March. It is interesting that this month holds the most violence for Yemen yet the government is coming back to power. Hopefully this trend does not continue as President Hadi regains control of the rest of Yemen. Shia Rights Watch condemns these unprovoked, indiscriminate crimes against humanity which plague the Yemeni Shia. There were 10 recorded Shia deaths this month in Syria; compared to the six of last month. There was a slight increase in the amount of Shia murders, but there was a slight decrease of injuries from 32 in August to 25 in September. All of these casualties came as a result of Syrian rebels detonating a car bomb in Lattakia. The numbers recorded from Syria are the bare minimum, because it is difficult to get information in or out of the war torn country. It is especially difficult in Shia towns that are surrounded by Daesh or Al Nusra Front. There are reports that Syrians rebels that were armed by the United States gave equipment to Al Nusra Front, an Al Qaeda affiliate. One begins to wonder when the United States will cease supporting militias that are not loyal nor serve their interests. On September 6, gunmen stopped two vehicles in Balkh, and pulled the passengers out of the vehicles. The assailants killed 13 Shia Hazaras, and the Taliban denies responsibility. Since the Taliban denies the incident, it is most likely the work of Daesh, but it could be the work of rogue Taliban members. It is troubling that the militants are killing the Hazaras instead of abducting them, because this could illustrate a significant shift in policy. There is no news on the abducted Hazaras from previous installments of the monthly anti-Shiism report, but hopefully they have not met the same fate as those of this issue. Pakistan continues to become a safer place for Shia Muslims, because Shia Rights Watch only has record of two religiously motivated attacks on Shias for the month of September. This month has the lowest amount of murders for Pakistan all year. The two murders were carried out by terrorist groups, and the third is supposedly unclear if it is driven by sectarian hatred. A Shia convert, Riaz Alvi, was killed in Charsadah by the terrorists of Sipah e Sahaba, and was threatened by Wahhabi groups shortly after following Shiism. A Shia man, Irfan Haider Zaidi, was attacked outside his shop by asailants with a pistol and later died from his injuries. His family claims he escaped an assassination attempt last week, but they did not report it. The pistol was sent to the police for forensic processing. It is promising that a Sunni majority country like Pakistan can stand against anti-Shiism and make real progress toward equal protection for all. There were four incidents of anti-Shiism in Bahrain this month, and it began when Iraqi football player, Zulfiqar Malik, flew to Bahrain to join a new professional football team. Upon arrival he was beaten for no reason by the Bahraini authorities in the airport. He was told to go back to Iraq because he was not welcome in Bahrain. Then there is the case of Sheikh Ahmad al-Jidhafsi, who was arrested for delivering an speech criticizing the Bahraini regime. His daughter, and granddaughter were arrested as well. It is reported that there were raids on the rally where he gave the speech, and the police fired tear gas and bird shot as attendees. Shia Sheikh Hassan Isa had his detention extended 15 more days by the government as the police continue their investigation, but it is clear that they do not have any evidence to prosecute him for funding terrorism. Finally, Sayed Ahmed Al-Wadaei, director of advocacy at the Bahrain Institute for Rights and Democracy brought attention to the injustices in Bahrain by making a statement to the UN Human Rights Council where he asserted that Shia Bahrainis were prevented from gaining Shia education, and had 38 mosques and religious sites detroyed by the authorities. As with other countries in the anti-Shiism report, there was a significant decrease in arrests this month compared to previous, but there is a possibility that Shia Rights Watch does not have all of the incidents so reporting to Shia Rights Watch is encouraged. Saudi Arabia has taken some drastic steps recently to punish anyone who is Shia, and make an example of those who disagree with them. Within a few days of each other. Saudi Arabia announced that Yemenis were baned from participating in Hajj this year and then they added Syrians would also not be allowed to attend either. This move by the Saudis holds Islam hostage to those who are not involved in the conflicts, politicizes Hajj, and Shia Rights Watch condemns their actions. Ali ibn Muhammad al-Nimr was arrested 3 years ago for taking part in protests, and was recently given a death sentence. He was underage at the time of the arrest, and has not had a lawyer during interrogation or his trial. Reports also show that he was tortured to give a false confession. Ali Mohammed is Sheikh Nimr’s nephew, and is being targeted for his faith as is his uncle. The amount of Shias killed by bombs this month decreased by 27%, and the amount injured by bombs decreased by 42%. Air strikes were much more deadly this month, but that is not surprising considering the lack of food, water, shelter, and medical supplies in Yemen currently. The amount of Shia killed using a combination of methods has remained about the same as last August. Shooting Shias increased significantly compared to last month, but that is only because of the one incident in Afghanistan. Afghanistan police and military were most likely more preoccupied about the Taliban taking the city of Kunduz than militants on the side of the road. Arrests have fallen from 53 to 6, but there is a possibility that Shia Rights Watch needs more information. There were no abductions this month compared to last month’s 10. The month of September appeared to be very quiet, but the possibility of terrorists killing Hazaras instead of kidnapping them is concerning. The previous months suggest that this month’s data is just an outlier, however Shia Rights Watch would like to remain optimistic that anti-Shiism is on the decline. 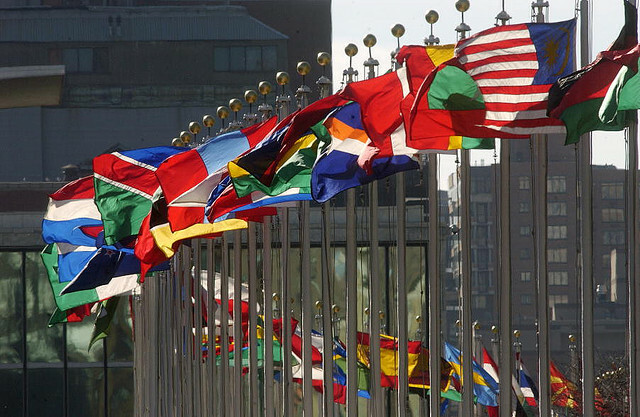 Afghanistan, Azerbaijan, Bahrain, Egypt, India, Indonesia, Iraq, Kuwait, Lebanon, Madagascar, Morocco, Nigeria, Pakistan, Saudi Arabia, Somalia, Syria, the United Arab Emirates, the United Kingdom, the United States and Yemen.